Moving to a new city can be challenging, but it’s also an opportunity for new experiences. 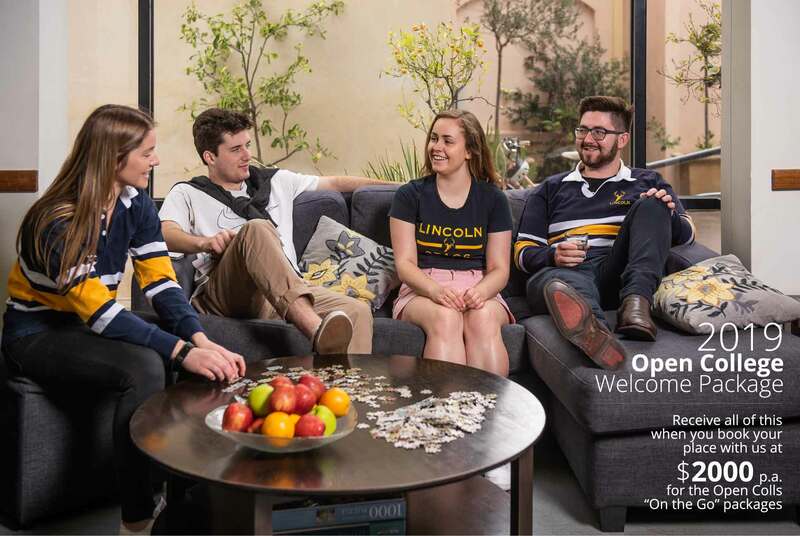 At Lincoln, we’ll help you make friends, explore Adelaide and succeed in your studies. Here’s what to expect if you become a friend of Lincoln through the Open Colls program. Residential Advisors Open Colls have their own “Residential Advisor” who provides them with community and social leadership within the College. Library access Books may be borrowed from the library during College Central office hours, 9am to 5pm Monday to Friday. Training All Open Colls and full-time residents must participate in compulsory online and in-person training. Open Colls may participate in additional training/development sessions made available throughout the year to Lincoln residents on an ad hoc basis. New in town? Don’t have a group of friends in Adelaide? Experience the benefits of College life with Lincoln’s Non-Resident “Open Colls” Program. Open Coll students get access to College life while living off-campus. You’ll explore the academic support and wellbeing programs of full-time College residents, as well as getting access to social and cultural events, and meals.